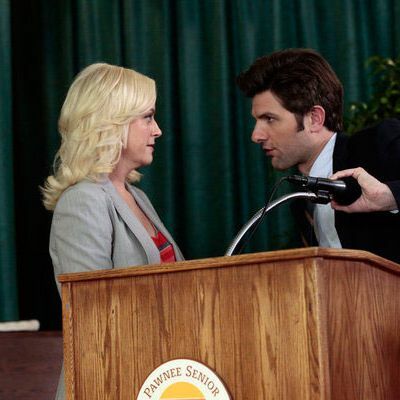 When I interviewed Adam Scott for a feature for New York Magazine in August, I asked him about working with Amy Poehler not just on Parks and Recreation as Leslie Knope’s boyfriend Ben, but on the movie A.C.O.D. (out next year; she plays his stepmother and nemesis). He said, quite sincerely, “I just love, love working with her so much that if I could, I would love to work with her on every single thing.” When I called Poehler to talk about Scott, however, I got a far more complicated response. Here are Poehler’s six weirdest (and not particularly true) observations of her co-star. And one bonus one from Jon Hamm.